19th September, Yancheng: Second-seed China A won their second gold medal at the 28th East Asian Tenpin Bowling Championships with victory in the Men's Trios final while topseed, Chinese Taipei 1 picked up their first gold in the Women's Trios. Xu Chen put in a clean game and struck home from frame 7 for a score of 246, Qi Wankang managed 188 but Wang Zhiyong went on a strikefest to roll the championship's first perfect game en-route to defeating Lee Won Seok, Lee Jung Soo and Oh Jin Won of Korea 1, 734-672 in the final match to win first gold medal and second for China A. The Chinese trio had earlier brushed aside another Korean trio of Jo Young Bin, Kim Jun Seong and Han Jae Hyeon, 674-616 in the second semi-final match to reach the final. Korea 1 breezed past topseed, Shen Ying-Te, Chen Chia-Hsing and Lin Pai-Feng, 651-567 in the other semi. In the earlier second block of the Trios preliminaries, Chinese Taipei snatched top spot with a sizzling 701 in the last game for a total 3791 to advance to the semi-finals as topseed. First block leader, China A2 finished second with 3742, 49 pins adrift. Third and fourth positions went to the two Korean trios with the second trio taking third spot with 3693 and the first trio earning fourth spot with 3651. 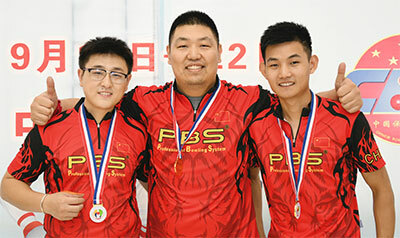 The second Hong Kong trio of James Lui, Jimmy Cheung and Ernest Kowk missed the cut by 28 pins to finish fifth. 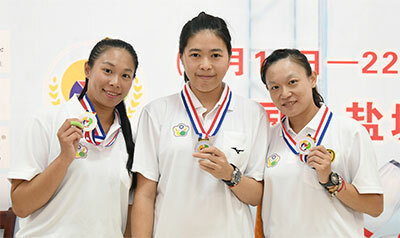 Meanwhile, topseed Chinese Taipei denied host China A a double victory when Wang Ting-Wen, Yang Hao-Ting and Wang Ya-Ting defeated third-seed, Peng Rui, Kong Min and Zhang Yuhong, 594-549 in the final to win their first gold. d the first Korean trio of Choi Hyeon Ji, Hong Hyeon Gyung and Lee Hyeon Gyung, 610-590 in the other semi to book their place in the final. After three events contested, China A took over the lead in the overall medal standings with 2 gold, 3 silver and 1 bronze medal after the men's victory in the Trios event. Korea is second with 2 gold, 2 silver and 7 bronze medals. Hong Kong and Chinese Taipei have 1 gold medal each but Hong Kong is third with 1 silver and 2 bronze medals while Chinese Taipei has 2 bronze medals. Competition will resume with the Team of 5 first block of 3 games after lane maintenance. They will complete their second block of 3 games tomorrow morning. The top 3 women's team and the top 4 men's team will advance to the semi-finals.